It was a history-making night for the ladies at the Oscars. And "Early Show" co-anchor Harry Smith had the opportunity Sunday night to go one-on-one with two of the night's biggest winners: Sandra Bullock and Kathryn Bigelow. 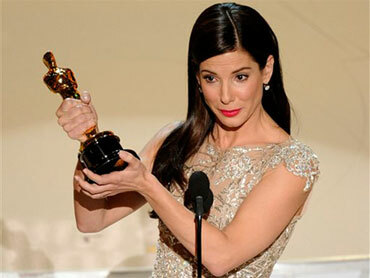 Smith first asked Bullock about this remark in her speech for Best Actress: "Did I really earn this, or did I just wear y'all down?" Bullock, who won for her tough, yet caring role in "The Blind Side," told Smith, "I may have worn people down, 'cause I hang in there. I don't go away. People say I can't do it, I say 'watch me.' You know, when they announced the name, which happened to be mine, there was self-doubt. 'Did I earn this, did I deserve it? Am I supposed to have it?'" Smith responded, "I think so." Bullock replied, hugging the statue close, "Well, I got it." Smith pointed out Bullock went through an interesting 24 hours, winning a Razzie for Worst Acting in "All About Steve" and an Oscar for Best Actress. "Life is all about balance," she said. "It doesn't let me get too big with myself. ... The Razzie is just special to me as this. Just not going to be as prominently displayed in the house. No, I'm just kidding, it'll be right next to the Oscar." Bullock thanked her mother in her speech. Smith asked Bullock about her mother's influence in her life. She said, "She was definitely one of those people that reminded us every day how grateful we need to be for the air and the sun, so you know, hopefully it still lives on in her kids." Smith also asked Bullock how she can keep her momentum. Bullock said you can't do that. "You know what's going to happen, it's going to fall down." She said, "It's like people are going to want to lock you off the pedestal. I don't know what I'm going to do next. I'd like to get back to life and just be quiet. I'll pick something crazy or unexplainable, and I'll just keep doing exactly what I've been doing for the last 15 years." Kathryn Bigelow, Best Director winner for "The Hurt Locker," also spoke with Smith. She said she hopes her win -- the first for a female in the category -- is the first of many for female directors. For Best Picture: "The Hurt Locker"
She said, "(My win) can be useful for other women and men who are following their dream, and have to be as tenacious as humanly possible to achieve that." Bigelow said winning six Oscars for her film was "a miracle." "It's extraordinary," she said, laughing. "I'm so proud, so flattered, so honored and humbled. It's a moment of a lifetime." Bigelow added the moment is also time to remember the people that her film addresses. She said, "It can remind us, even as we are having this wonderful interview, there are men and women who take that lonely walk to a rubble pile in some obscure part of the world, never knowing what they may find. And if we can just take a moment to appreciate that, then the film will have fulfilled its destiny."